Weight loss is an independent prognostic factor for decreased survival in cancer patients. The effectiveness of treatment is impaired in patients with weight loss. The aetiology of this weight loss is complex and poorly characterised. Decreased calorie intake may be important. The reasons for decreased intake are unknown. 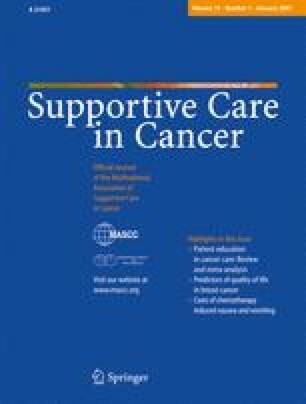 To determine in adult patients with cancer, who had not started chemotherapy or radiotherapy, the prevalence of symptoms which carry a risk to nutritional status and how these relate to weight loss, tumour burden and primary tumour site. New patients referred for treatment of any form of gastrointestinal (GI) cancer, non-small cell lung cancer or lung mesothelioma completed a validated questionnaire recording symptoms contributing to weight loss (Patient-generated Subjective Global Assessment—PG-SGA). In a subset of patients without metastatic disease, computed tomography scans were assessed to determine tumour burden. Between August and October 2004, 122 patients with GI and 29 with lung cancers were recruited. There were 48% of GI and 28% of lung cancer patients who had lost weight. Sixty-two percent of the patients had one or more symptoms at presentation. The frequency of symptoms varied according to the site of disease. The most common symptom at all tumour sites was loss of appetite (38%). There was a weak but significant correlation between the number of symptoms and amount of weight loss (r=0.347). Patients reporting a reduced food intake had more symptoms than patients who had not lost weight. Tumour burden did not correlate with weight loss. The symptoms in cancer patients occur across different types of primary tumours, may affect food intake and have a part in causing weight loss. More information on the role of symptom management in improving nutritional status is needed. This study was approved by the Research and Ethics committees of the Royal Marsden Hospital and was supported by funds provided by the Rank Nutrition Fund, The Henry Smith Foundation, and the Trustees of the Chelsea and Westminster Hospital, UK.